Camera pan of a haunted house or abandoned building. 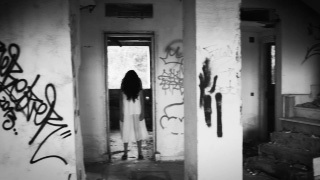 A girl in a white dress, with hair covering the face character is standing in a doorway. Camera pans back to center on scary girl. Howling wind sound. The video is in black and white.